More and more businesses are aiming to reduce their carbon footprint or make aspects of their operations carbon-neutral. 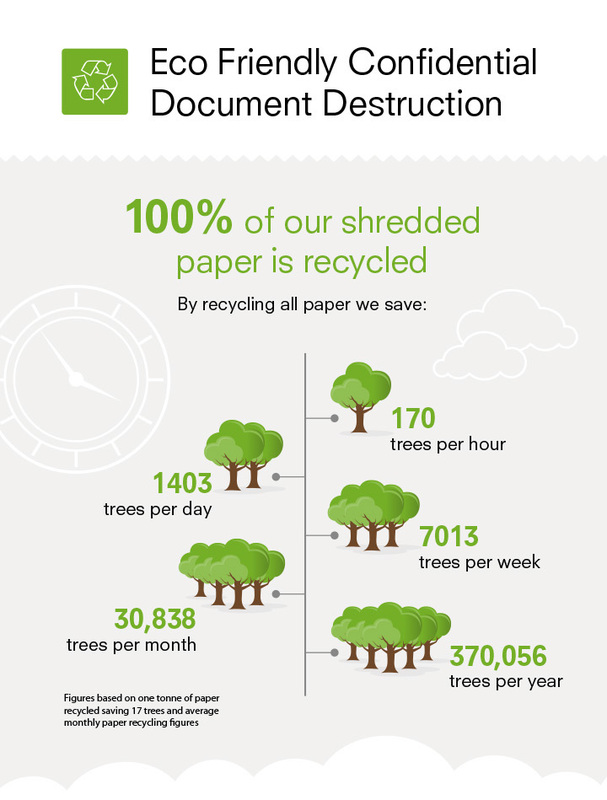 Using an eco-friendly confidential document destruction company can help reduce your own carbon footprint. At Shred Station, we’re always working on new initiatives for eco-friendly confidential document destruction to help us become greener and more energy-efficient in our operations. In an average month, we destroy a hefty 1814 tonnes of waste paper – and every single sheet is recycled. Since every tonne of recycled paper potentially saves three cubic yards of landfill space, that makes 248 cubic yards per day, 5442 cubic yards per month or 65,304 cubic yards of landfill space saved each year. We also offer carbon offsetting as part of our bespoke services for clients. So far in 2017, we’ve planted 4200 trees as part of our carbon-offsetting scheme. Once grown, they will absorb up to 201,600 pounds of carbon dioxide each year, helping to reduce the impact of carbon emissions and ultimately prevent global warming. Textiles also play their part. All the clothing that we shred is used to make either Refuse Derived Fuel (RDF) or Solid Recovered Fuel (SRF), which can be used in a range of industrial processes. So much for the recycled material itself. There are also many areas where we’ve made our operations greener. All our new trucks meet the latest Euro 6 emissions standard, and we’ve now replaced all our existing Euro 4 trucks with Euro 6. We already have one electric-powered shredding truck, and we’re looking at hydrogen and battery power for future vehicles. Our head office at Norwich is completely powered by solar energy, and all our depots now have energy-efficient LED lighting. So if environmental concerns are important for you when choosing suppliers, you can’t do much better than Shred Station when it comes to selecting a provider for eco-friendly confidential document destruction.